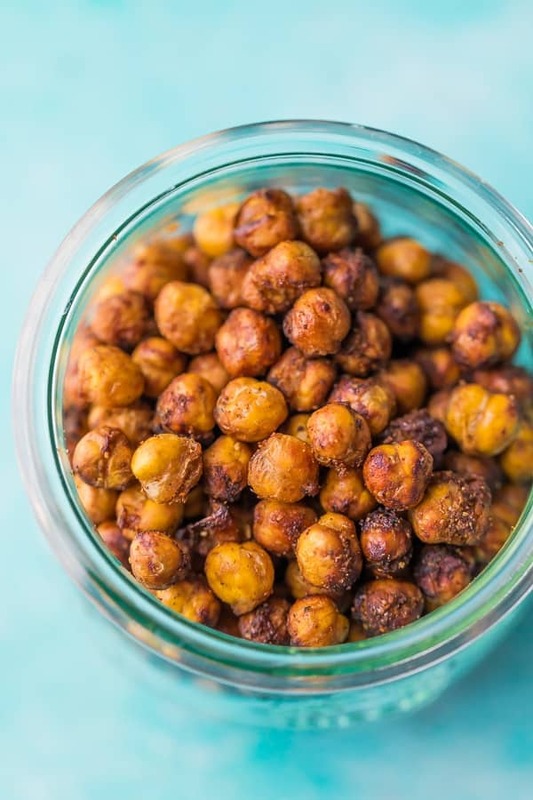 Crispy air fryer chickpeas are the tastiest and crunchiest snack you will find. Using the air fryer cuts the cook time down to 15 minutes, and they are so much crispier than in the oven! 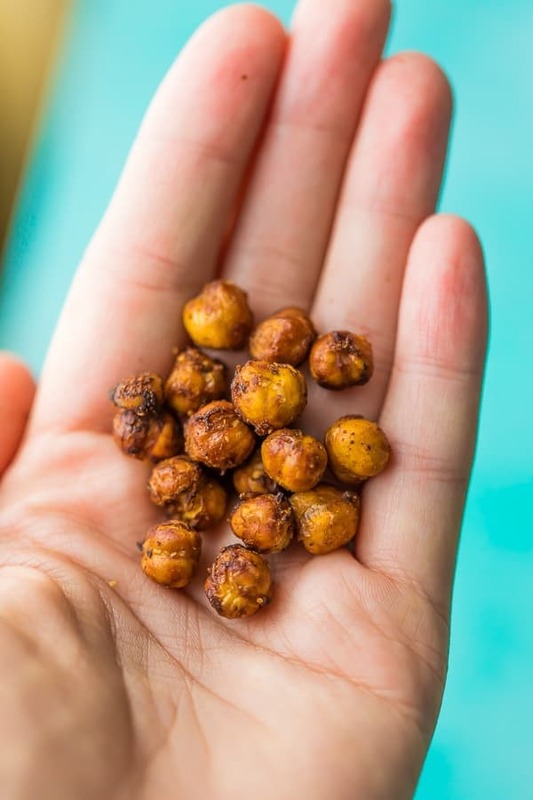 Vegan and gluten-free, these crispy roasted chickpeas are an awesome healthier snack. I have always loved the concept of crispy roasted chickpeas, but I have often failed in execution. It always seems like some of them get crispy while others are still chewy. And still others are burned. Not only that, but you have to wash and dry the chickpeas before roasting, and you have to roast them for quite awhile. Well, enter the air fryer. GAME CHANGED. No need to dry these chickpeas, and they are ready for your snacking pleasure in 15 minutes. Yup. 15 minutes! We purchased our air fryer in December and it has quickly become one of our favorite kitchen appliances. It cooks food quicker, too! 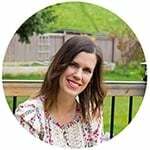 What are the downsides to the air fryer? I will admit to initially being disappointed with the small size of the air fryer. The air fryer itself is not small, but the basket inside is small. Most food you need to cook in batches (ie: chicken breasts, sweet potato tots, salmon patties and anything chip-shaped). However there are some exceptions to this rule; frozen french fries and these air fryer chickpeas being two of them! 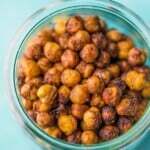 How can I use these crispy roasted chickpeas? You could use them as a salad topper (try this Southwestern Kale Chickpea Salad), in tacos (they go awesomely well with cauliflower! ), as part of a Buddha bowl, or just enjoy them as is. How do I store these crispy roasted chickpeas? They keep better stored in a container with the lid off (I found this out by accident!). We store in a jar in the cupboard. Drain and rinse chickpeas. Toss with olive oil and spices. 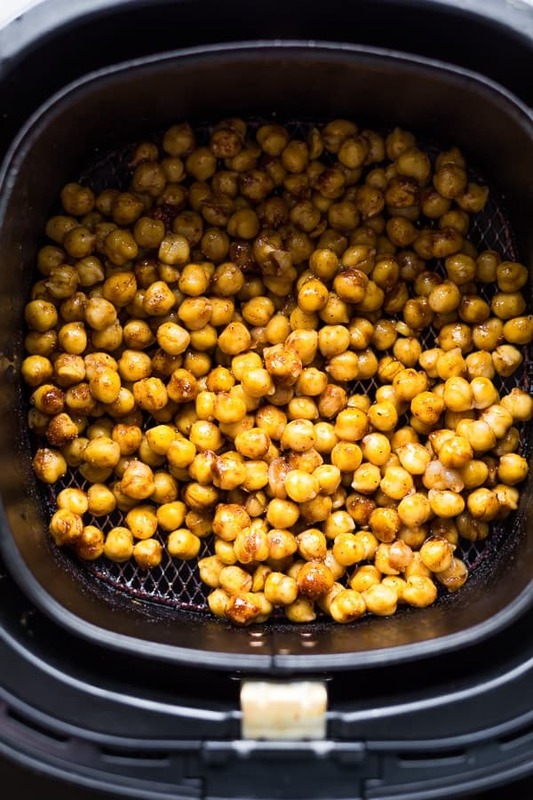 Dump the whole batch of chickpeas in the air fryer basket. Cook for 12-15 minutes, shaking a couple of times. 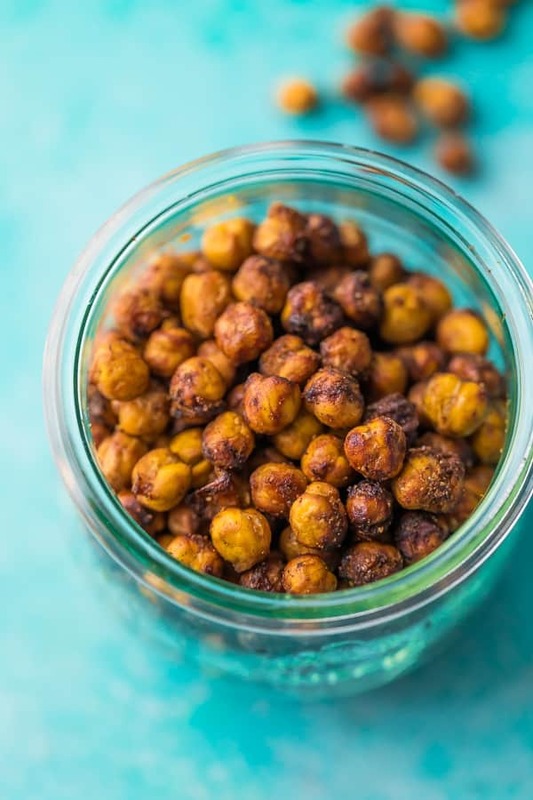 When chickpeas are cooked to your liking, remove from air fryer, taste and add more salt and pepper to taste. Store in an open container. If you'd like to up the flavors you could try tossing in one of the spice blends from this post. Ii don’t yet have an air fryer, so I’m still using the oven, and when doing them in the oven, only oil and salt are added before cooking. But after, my favorite concoction is a good curry powder, added cumin and a touch of chipotle for heat and smokiness. Since it takes about 30-35 minutes at 450 degrees int eh oven, I intend to get an air fryer especially for this, which I make several times a week. I have made them three times with different spices – Moroccan with a touch of haberano olive oil and Tandoori. The last two times I “marinated” the chickpeas with the spices for about ten minutes to absorb the spices. They have been a hit. Even introduced this recipe to my coworker. Thank you. I am so happy you’ve enjoyed! I must try marinating mine next time. Thanks for your review, Bee! These are yummy. I had to use smoked paprika, so I halved the amount. So glad you enjoyed! I must try with smoked paprika next time! Fantastic! I’m on Weight Watchers so i slipped the oil and just used the spices and they address a fabulous” free” snack for me. I will need vet use the oven again! Thanks so much! Yay! So happy you enjoyed! OMG! I will never make roasted chickpeas in the oven again. These are INSANE! Air fryers are simply much safer to use. do they stay crispy? ive tried the oven baked ones and they don’t. yay! thank you for replying im off to try them !